Bangkok, Thailand – Phase one of a two-week teaching trip to southeast Asia has now come to an end for me and seminarians Jeff Swords and Wayne Zhange from Concordia Lutheran Theological Seminary, St. Catharines, Ontario. They are assisting me in teaching while broadening their own horizons in regards to overseas missions and cross-cultural outreach. 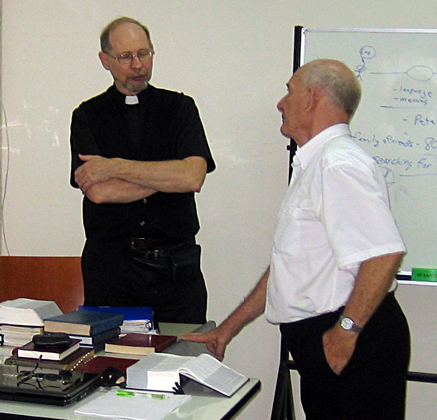 Dr. William Mundt (left) consults with Dr. Leonard Harms prior to a teaching session in Bangkok. The first week of classes ended Friday afternoon, March 5, at the Lutheran Institute of Southeast Asia centred in Bangkok, Thailand. Dr. Len Harms, former LCC mission executive coordinates training opportunities out of that centre. Twelve Thai pastors and deaconesses spent the week training in basic evangelism, mission and apologetic principles based on the Bible and lessons from the early church, and the history of missions. Their final assignment was presenting their own proposals for intensifying outreach activities in the areas where they serve. Projects they identified included support for seniors, craft and a home-based bakery instruction for housewives, special open-house events, concern for the Thai native population (the Akha) and so on. If all these methods sound familiar, it may be because they are much like what LCC pastors and congregations might do. The sights, sounds, tastes, smells and scheduling (Thai time is different!) may vary, but ultimately outreach is about speaking the good news of the Gospel of Jesus Christ into the needs of people we connect with daily. Throughout the Bible and mission history, such personal contacts have proven most successful. The challenge now is for those trained to become trainers for the next two years in the cities and villiages where they already serve. The goal is to train and equip and encourage their members to be a part of the local mission. After prayers and fond farewells from these brothers and sisters in Christ, whom we now know as friends also, we depart for Cambodia where a large group of eager learners will soon arrive at the Chin Tong Guest House, Phnom Penh, for a similar class beginning Monday afternoon, March 8. After that we return, in stages, to St. Catharines, exchanging +40 degree Celsius dry weather for somewhat cooler and wetter conditions at home. Rev. Dr. William Mundt is a professor of theology at Concordia Lutheran Theological Seminary in St. Catharines, Ontario. This entry was posted on Saturday, March 6th, 2010 at 1:35 pm and is filed under International Lutherans, Thailand. You can follow any responses to this entry through the RSS 2.0 feed. You can leave a response, or trackback from your own site.